Rheology of Polymer Blends and Nanocomposites: Theory, Modelling and Applications focuses on rheology in polymer nanocomposites. It provides readers with a solid grounding in the fundamentals of rheology, with an emphasis on recent advancements. 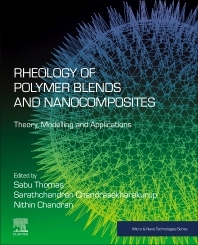 Chapters explore potential future applications for nanocomposites and polymer blends, giving readers a thorough understanding of the specific features derived from rheology as a tool for the study of polymer blends and nanocomposites. This book is ideal for industrial and academic researchers in the field of polymer blends and nanocomposites, but is also a great resource for anyone who wants to learn about the applications of rheology. Professor Thomas is the Director of the International and Interuniversity Centre for Nanoscience and Nanotechnology and full professor of Polymer Science and Engineering at the School of Chemical Sciences of Mahatma Gandhi University, Kottayam, Kerala, India. He is an outstanding leader with sustained international acclaims for his work in Polymer Science and Engineering, Polymer Nanocomposites, Elastomers, Polymer Blends, Interpenetrating Polymer Networks, Polymer Membranes, Green Composites and Nanocomposites, Nanomedicine and Green Nanotechnology. Dr. Thomas’s ground breaking inventions in polymer nanocomposites, polymer blends, green bionanotechnological and nano-biomedical sciences, have made transformative differences in the development of new materials for automotive, space, housing and biomedical fields. Professor Thomas has received a number of national and international awards which include: Fellowship of the Royal Society of Chemistry, Distinguished Professorship from Josef Stefan Institute, Slovenia, MRSI medal, CRSI medal and Sukumar Maithy award. He is in the list of most productive researchers in India and holds a position of No.5. Professor Thomas has published over 720 peer reviewed research papers, reviews and book chapters. He has co-edited 54 books published by Royal Society, Wiley, Wood head, Elsevier, CRC Press, Springer, Nova etc. He is the inventor of 4 patents. Prof. Thomas has delivered over 300 Plenary/Inaugural and Invited lectures in national/international meetings over 30 countries. He has already supervised 74 Ph.D theses. Nithin Chandran is a Researcher at the School of Chemical Sciences, Mahatma Gandhi University, India.